Raise your hand if you will do anything to eliminate or shorten some of the meltdowns that come along with that cute, tank full of emotions, child of yours (arm up over here). Parenthood is tough for anyone and everyone and takes every ounce of patience you thought you had and then some. When my daughter’s pediatrician entered the room at her 3-year-old well checkup, she raised her eyebrows and asked how we were doing with an understanding smile and nod. She knows I’m a child life specialist and I jokingly (but not really) said how I really didn’t realize the meltdowns and challenging behaviors were so precisely timed to start the day before she turned 3. I mean seriously, I knew they were coming, but I still wanted to pretend it wasn’t! In these days when meltdowns come more frequently than solo bathroom breaks, I have so much gratitude for the writers and illustrators who teach children healthy habits and strategies. Books are the one tool that never seems to fail to help children recognize, validate, and give healthy ways to cope with emotions is through books. Since children often need more than one time to learn and implement these little (okay big) lessons, books are a saving grace for this tired Mama! I probably don’t need to be another voice telling parents how important it is to read to children from the get-go. We know it helps them understand the world around them, learn how to communicate, bond with caregivers, identify routines, and so much more. Reading to my children has truly been one of the most special experiences for me as a mother. Not only does it give me all of the feels to see them immersed in story, I feel so proud when I see them take away information they’ve learned to help themselves master a skill, understand emotions and identify ways to cope with stressful situations (just to name a few reasons). Children’s books have been a guiding light to help me remember to step outside of my own agenda and remember on tough days that young children are full of big emotions whose brains are rapidly growing. When I focus on the normalcy and the reason why for their behavior, I find it easier for myself to remain calm and help them figure out how to calm and/or problem solve. 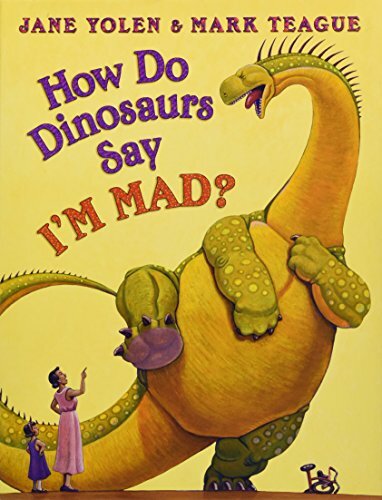 “How do dinosaurs say I’m Mad?” by Jane Yolen and Mark Teague, is witty while teaching a great lesson about how to cope with anger. I love reading it with really dramatic facial expressions and watching my daughter playfully mimic me. Each page gives examples of what the dinosaur doesn’t do when mad (e.g. scream and shout, throw books, etc.) Then, as pictured below, it shares a healthy way to respond when feeling mad. When the kids were napping one day, I had some fun taking photos. Squish/stress balls are one of my favorite tangible coping tools to give to kids and teens. I thought I would give this dino his very own squish ball, simply made with a bit of air in a water balloon. When I showed it to my girl, she had the sweetest amused reaction. It was surprise mixed with joy and excitement to play. Any bit of guilt or shame I had for using spare time for the pictures all made it seem WORTH IT. What are your favorite books to teach young children about emotions and how to cope? Subscribe to the newsletter, so you don't miss the ones I will be sharing next!